Spearman correlation is a non-parametric test to determine the degree of correlation (association) between two variables. Select any cell in the range containing the dataset to analyse, then click Correlation on the Analyse-it tab, then click Spearman. Select any cell in the range containing the dataset to analyse, then click Analyse on the Analyse-it toolbar, click Correlation then click Spearman. rs ≠ 0 to test if the variables are correlated. rs > 0 to test if the samples are positively correlated, where observations of the variables tend to increase together. 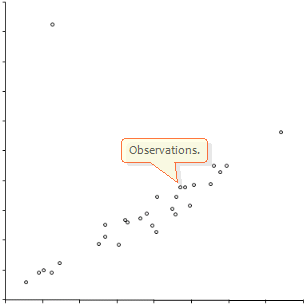 rs < 0 to test if the samples are negatively correlated, where observations of one variable tend to increase as observations in the other variable decrease. Enter Confidence interval to compute around the Spearman rs statistic. The level should be entered as a percentage between 50 and 100, without the % sign. The Spearman rs correlation statistic and confidence interval are shown. METHOD The confidence interval is calculated using the Fisher's Normal transformation (see  or ). METHOD The p-value is calculated using the t- approximation (see ). For small sample sizes ≤ 30 exact tables should be used (see ), or use the Kendall correlation which calculates exact p-values for small samples. David J. Sheskin, ISBN 1-58488-440-1 2003; 1016. Conover W.J. ISBN 0-471-16068-7 1999; 314.